Join Molly Fowler, The Dining Diva, on the road less traveled! Register NOW to reserve your space for this exclusive, small group adventure! Traverse the STRADA DEL PROSECCO, a wine route off the tourist grid, visiting several vineyards and villages; stop to sample wines where they’re made, exploring historical sites along the way, and stay at the incredible 18th-century Palladian-style VILLA DI SOLIGO. In CONEGLIANO, visit the towering castle and the inviting small wine bars near the city center. 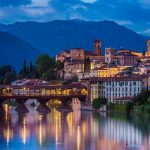 Tour a distillery in BASSANO DEL GRAPPA and sample some of the best grappa in Italy at a tasting complemented by asparagus and olives. Afterward, cross the RIVER BRENTO on a 16th-century Palladio- designed wooden bridge. Embark on a guided excursion to the city of TREVISO with its Venice-like canals, Palladian villas, and Renaissance monuments. Learn about cheese production and taste the world-class results at a CHEESE FACTORY in TREVISO. Visit the SOUTH TYROL MUSEUM OF ARCHAEOLOGY in BOLZANO, home of OTZI THE ICEMAN, a 5,300-year-old Alpine mummy. Spend a day and night exploring the Tyrolean valley-town of LIENZ. Shop in town, ascend the 13th- century BRUCK CASTLE, or explore the ancient Roman town of AGUNTUM with its sparkling new museum. Experience the lakeside city of KLAGENFURT where you’ll spy LINDWURM, the dragon-like town mascot, and visit the BENEDIKTINERMARKT, the greatest street and food market in Austria. Discover GRAZ and its medieval Old Town main square, then tour the city’s STYRIAN ARMORY and its vast collection of armor and weaponry used in the 1683 defense of Austria. You’ll have free time to visit the sparkling shops of GRAZ and to ride the funicular up to the SCHLOSSBERG, a hilltop fortress above the city and very near our hotel! Enjoy a morning “FOODIE’S TOUR” of GRAZ, the culinary capital of Austria. At the heart of Graz’s food culture is the KAISER JOSEF MARKET, where local farmers offer their produce in the market square. 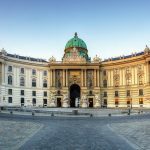 Explore the imperial delights of Vienna, including a visit to the HOFBURG PALACE complex and ST. STEPHEN’S CATHEDRAL, then stop for one of VIENNA’S FAMOUS CAKES at DEMEL COFFEEHOUSE. 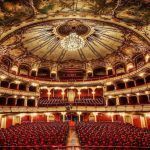 Enjoy a guided tour of the VIENNA STATE OPERA, where Mozart introduced his operas The Magic Flute and The Marriage of Figaro, followed by a private piano concert in BOSENDORFER HALL. While in Vienna, you’ll have free time to shop or to attend WIENERWEISNFEST – the Annual Viennese fall festival! What perfect timing! Follow your guide through the stately chambers and grounds of SCHONBRUNN PALACE, ending with an APPLE STRUDEL DEMONSTRATION AND TASTING in SCHONBRUNN PALACE’S CAFÉ RESIDENZ. Travel through the Vienna Woods to a gala farewell dinner at HOF ZIMMERMAN, a family-run HEURIGER (wine restaurant) outside Vienna where you’ll enjoy a traditional dinner accompanied by traditional Viennese SCHRAMMEL MUSIC played on the accordion and violin. All through your Road Less Traveled tour, you’ll have ample opportunity to explore, shop, and enjoy each new destination! Space is limited because of smaller hotels and “boutique” venues we will be visiting! Reserve by March 19, 2018 to guarantee rates. Call Beyond Group Travel at 713-954-4825 for more details, terms & conditions, and to reserve your space! Trip escorted by Beyond Group Travel, and The Dining Diva, Molly Fowler. Anything not specifically mentioned in the “inclusions” list above.